Apartment block "Bergkristall". Below Wengen, 600 m from the centre, in a quiet, sunny position on a slope. In the house: central heating system. Pre-arrival grocery service. Shop, supermarket 600 m, restaurant 300 m, bar, bakery 600 m, 7 minute walk to the centre, railway station "Wengen" 600 m. Cable car 600 m, children's playground 300 m. Please note: car-free holiday complex. Arrival via mountain railway. Arrival is only possible by train from Lauterbrunnen – 14 minutes driving time. "Apt. P", 3-room penthouse 50 m2. Bright, partly with sloping ceilings, comfortable and cosy furnishings: living/dining room with open-hearth fireplace and TV. 1 room with 1 double bed (2 x 90 cm, length 200 cm). 1 room with 2 beds (90 cm, length 200 cm). Small kitchen (oven, electric coffee machine, Capsules for coffee machine (Nespresso) extra, fondue Set (cheese)). Shower/WC. Balcony. Marvellous panoramic view of the mountains and the valley. Facilities: hair dryer, logs (extra). Internet (WiFi, free). Please note: non-smokers only. I could not believe my eyes when I saw the view from this apartment! This alone is enough to rate it 5 stars, because I could have stayed in its big balcony staring onto the sky-high peaks and the magical Lauterbrunnen valley with little need for anything else. The apartment is spacious, comfortable, well appointed and above all, well located in terms of privacy and view point. It is quite an inclined 10 min walk from the train station, and then 3 flights of stairs, but we didn’t mind at all because we were always enthralled by all that beauty... and it helps that my wife and I are in good shape. We had a lovely 4-night stay here. 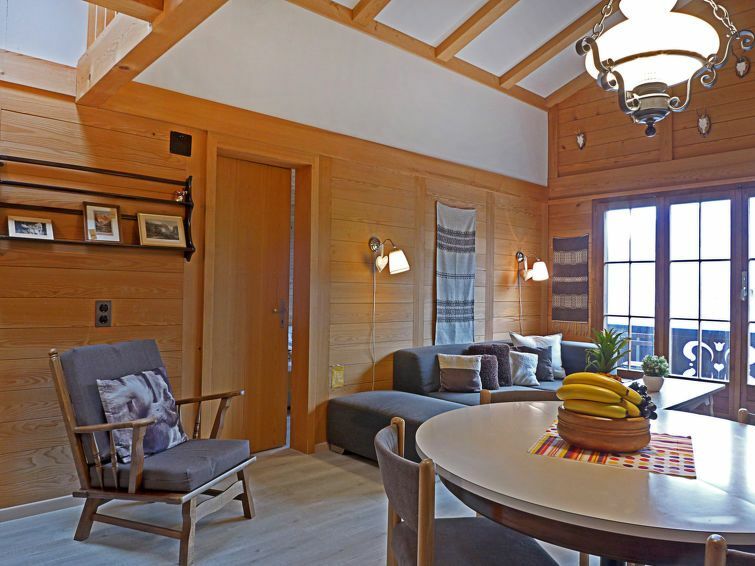 Wengen is a great location in the Jungfrau Region and this apartment worked well for 4 of us. We woke up to incredible views from our balcony...looking down on the Lauterbrunnen Valley as well as seeing Jungfrau in all its glory. The apartment was comfortable, clean, and well equipped, and the people at the rental office were friendly and helpful. This location is a short walk uphill into town and 3 flights of stairs up in case that matters to you. Check out the events put on by the Wengen Tourism office as there was a culinary tour one evening and a cultural music night another....both free. We got the 3-day Jungfrau travel pass and we're glad we did as that allowed us to get to places we would not have ventured to otherwise, by train, gondola and able car. This was a good spot to base ourselves from. I recommend this apartment. Eine ideale Wohnung nicht weit vom Zentrum. Küchenausstatzung sehr minim also keine Kochkünste zubereiten. Gut beheizt und der Balkon ist bis 17:00 besonnt.